The 24th Annual Grand Celebration Powwow kicks off Friday, June 19, with a grand entry at 7 p.m. at the powwow grounds near Grand Casino Hinckley. The local host drum is Little Otter from Mille Lacs. Invited drums include Big Bear from Saskatchewan and Thunder Hill from Oklahoma. Masters of Ceremonies are Terry Fiddler of Prairie Island and Amik from Hinckley. Grand entries will also be held at 1 and 7 p.m. on Saturday, June 20, and 1 p.m. on Sunday, June 21. For information call Nathan at 800-472-6321, extension 4475. Visitors are invited to bring their own chairs, but bleacher seating is also available. Campgrounds are available at the powwow grounds. Campers need to bring their own camping gear. Security and medical staff will be on the premises. Drugs and alcohol are prohibited. A golf tournament fundraiser for WEWIN (Women Empowering Women for Indian Nations) will be held at Grand National Golf Course Saturday, June 20. The tournament is a four-person scramble with payout categories for men, elders and women. Entry fee is $400 per team. For details call 320-532-7486 or 320-384-7427. 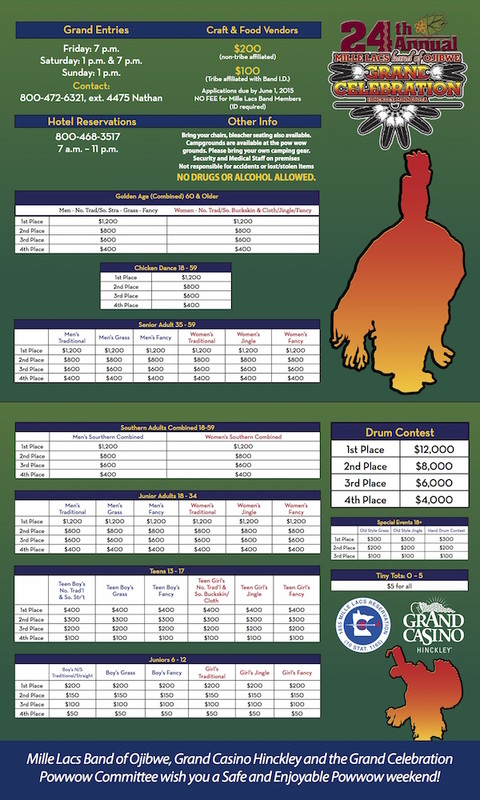 For information, call 800-472-6321 or visit grandcasinomn.com.